UCC will contest their first Fitzgibbon Cup final in six years after edging DCU in extra-time at WIT. UCC celebrate at the final whistle. Chris O’Leary fired home an 82nd-minute penalty as UCC grabbed a dramatic extra-time win over DCU in Waterford tonight. 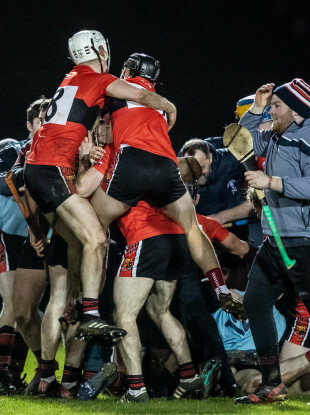 Wild celebrations greeted the full-time whistle as the Cork students squeezed through to their first Fitzgibbon Cup final in six years. DCU top scorer James Bergin had a late, late penalty appeal waved away by referee Thomas Walsh, and the league champions twice led by two points in the second period of extra time but couldn’t kill off UCC. Wing back O’Leary was a towering figure for the victors. The Valley Rovers man hit 1-5 (0-4 from play) including two huge extra-time points. Cork attacker Shane Kingston contributed 1-5 while Kerry forward Shane Conway was the star of the second half and finished with six points to his name. The sides were level on nine occasions during what was a tense encounter. Bergin, who tallied 0-10, forced the additional 20 minutes with a free two minutes into stoppage time. Kingston shot 1-3 in the first half as UCC reached the dressing rooms ahead on a score of 1-8 to 0-10. DCU used Chris Crummey as a seventh defender and implemented their short game from the off. Sean Morrisey struck two points while Damien Reck and Bergin added singles as they raced to a 0-4 to 0-1 lead after seven minutes. O’Leary then landed two massive points as UCC reeled in the early pacesetters. Conway was on target twice before Kingston levelled the match at six apiece. Donal Burke and Bergin then moved the Dublin side back in front. UCC found a major breakthrough on 24 minutes, O’ Leary’s long-range free breaking kindly for Kingston who duly lashed the ball into the roof of Oisin Foley’s net. The 21-year-old Douglas man tacked on another point before the interval. DCU worked their way into a two-point lead with 13 minutes left in the second half but Conway had other ideas. A wonderful solo point in front of the stand followed by a free made it all square. He then set up Kingston for the lead score on 54 minutes. Bergin eventually brought it to extra time. When play resumed, Conway registered a disputed free for UCC. The sides were tied on three further occasions before Darren Mullen and Bergin regained a two-point gap for DCU. O’Leary struck two monster scores but Crummey drove forward to leave it 0-22 to 1-17 to DCU on 76 minutes. However, in added time of extra time, UCC sub Sean Hayes was bundled over by Eoghan O’Donnell. After a moment’s delay as referee Walsh consulted with his umpires, O’Leary’s misstruck penalty squirmed under the unfortunate Foley to send UCC into the decider. Scorers for UCC: Shane Kingston, Chris O’Leary (1-0 pen, 1f) 1-5 each, Shane Conway 0-6 (4fs), Mark Coleman 0-1. Scorers for DCU: James Bergin 0-10 (8fs), Rory O’Connor 0-3, Billy Ryan, Sean Morrissey 0-2 each, Rian McBride, Chris Crummey, Darren Mullen, Damien Reck, Donal Burke 0-1 each. Email “Last-gasp drama as extra-time O'Leary penalty fires UCC into Fitzgibbon final”. Feedback on “Last-gasp drama as extra-time O'Leary penalty fires UCC into Fitzgibbon final”.